Actually it was Monday bike ride (Memorial Day). Nooksack River quite high near Ferndale with snow melt from Cascades. 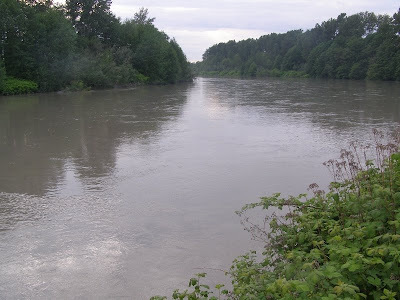 River seen from Nooksack Dike bike trail. I went through Ferndale twice that day just riding around. At least it wasn't a waste of fuel. That's the nice thing about the Sunday drive concept on a bicycle. I did get hungry, however, but a supermarket solved that problem. Friendly wave to the truckers who brought food to the supermarket.